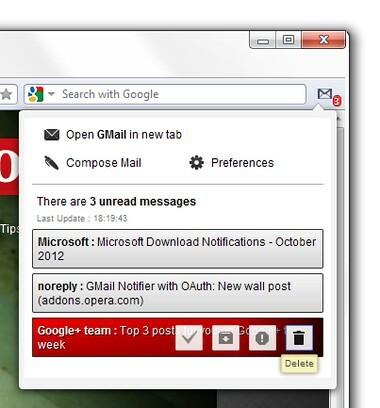 GMail Notifier is a small, simple and fast extension to show the number of unread mails in your Gmail-Account(s) in front of a button and the titles of the messages in the button-menu. 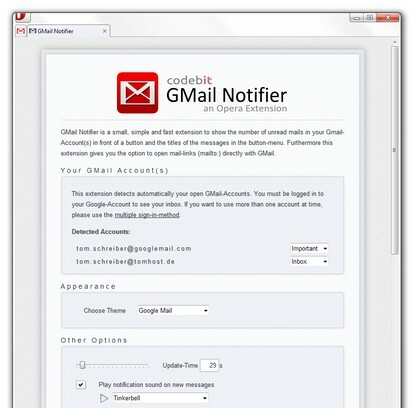 Furthermore this extension gives you the option to open mail-links (mailto:) directly with GMail. Çalışmıyor, mailleri kontrol etmiyor hesaplarım etkin fakat hesap yok diyor. 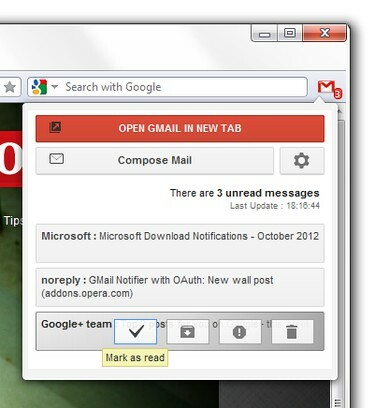 Начиная с 29.10.2013, GOOGLE что-то изменил в авторизации на своих сервисах, и GMail Notifier перестал логиниться к почте, пишет "Нет активных аккаунтов Google Mail, пожалуйста войдите в вашу учётную запись GMail и попробуйте ещё раз", поправьте пожалуйста. Confirm. Looks like stop working few days ago. Stopped working a few day ago. Seems i'm not the only one. I agree with rhonnysparks, the login seems not to work anymore, there's always the X on the icon, but if I press, for example, "compose mail" it redirects me correctly on gmail, since I'm logged correctly. It might be related to Google changing their login. The extension keeps on saying for me to login (despite being logged in). Pressing "refresh accounts" on the preferences page doesn't help. I've mentioned how to fix it here: http://code.google.com/p/google-mail-oex/issues/detail?id=116#c1 just need the dev to get around to releasing the fix.